How to Access iTunes Backup without Password? Posted by Vicky Tiffany on Jun.17, 2016 19:54 PM. Mobile devices have turned out to be a crucial part in the daily life of most humans. We store a wide range of things on our mobile phones like favorite music, photos, text messages, contacts and even our banking details. Some of these data are of great value to us and so it becomes important that we should take the best care of them. As most of us know, backup is the easiest and the best solution available to keep our data secured. If you are the user of iDevices, you might be well-aware of the fact that iTunes can be the best choice when it comes to backup of data. iTunes Backup is an excellent option available for users of Apple devices to make sure that their data will have a backup. Also, iTunes enable the users to set up a password to access their data, such that unauthorized access can be avoided. But, what will happen when you forgot iTunes backup password? No need to fret and do not come to a conclusion that you cannot get access to the data saved on iTunes backup, there are ways that you can follow to access iTunes backup without password. 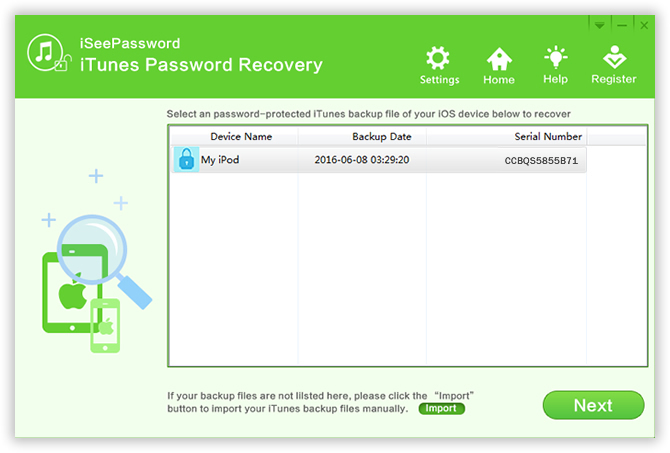 Even though, different methods are followed by different users for accessing iTunes backup without the password just because it was lost or forgotten, the safe and the easiest method is to rely on iSeePassword iTunes Password Recovery . This tool will help you in unlocking your iTunes backup password and then you can restore different data like apps, photos, videos, music, notes, calendars and contacts. It fully supports all versions of iTunes Backup and so you need not have to worry, even if you use the latest. This app will work in high recovery speed and it supports multi-core GPU and CPU. 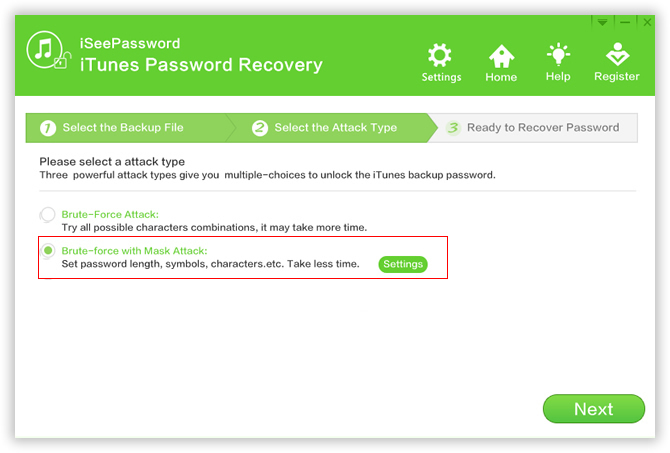 This app will help you recover password of iTunes Backup just within three easy-to-follow steps. You can free download the trail version and give it a try. 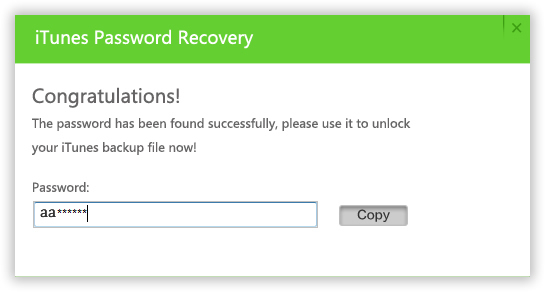 Before you start, you should first download and install this iTunes password recovery application on your computer, the installation process is straightforward, then launch it. You'll get the main window below. 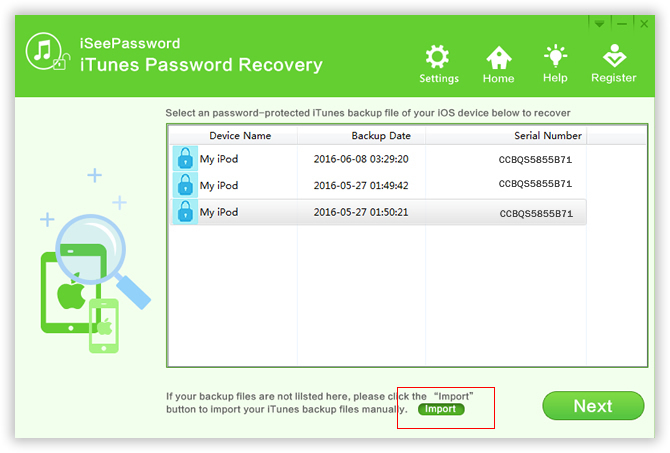 This step, you need to import your password-protected iTunes backup files to the program. Click "Import" button on the toolbar of the program, all of your iTunes backups will be detected automatically. Just select the one you want to remove the password. If the backup file was not listed in here, choose the "Add File" button to select the backup file location you know. You can see there are four types of attack integrated in the program, including Brute-force Attack, Mask Attack, Dictionary Attack and Smart Attack. If you could remember any part of your password combination, like password length, upper case, lower case, prefix or suffix letter. I highly recommend using "Brute-force with Mask Attack" mode as it can perform a fast computational and recovery speed. 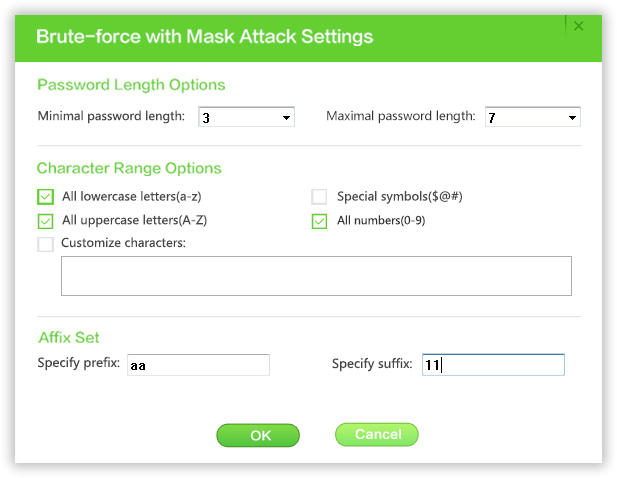 When you decide to select Mask attack option, you'd better set a specified range, like the 'Password length' and 'Character Ranger' Options, or Master, then this program will perform every possible combination of characters. The more accurate the information you can remember, the better and faster the work will get done. After setting the range, click "Start" button to begin the compute your backup password, it will take some times depend on how complex your password is. May be ten minutes or one hour. So, you can let your computer work alone. when the program recover your password successfully, a window will pop up appearing your password. You can click "Copy" button to copy and past your password to text or word. 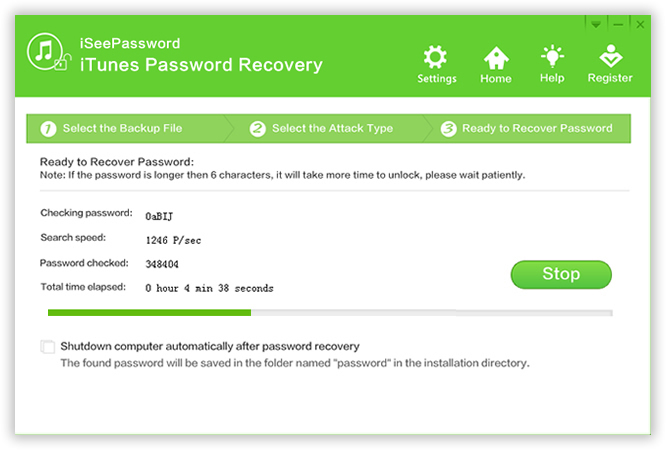 To quicken the process of password recovery, this application provides support to multi-core CPUs. This means that if your CPU speed is more, the process of recovery will be even faster as compared to using a system with lesser CPU. When a new data is added to your phone or tablet from Apple, the same will be backed up in iTunes by replacing the very old one. So, in case any type of data loss happens in your iOS devices, it's a good habit to regularly back up your iPhone, iPad and iPod to iTunes. But if you Created a password to protect your sensitive data on iTunes backup, make sure you don't use overly complex password, and memorize it. When you wish to immediately access iTunes Backup and if you cannot recollect the password of iTunes, no need to worry, you can get help from iTunes Password Rescuer.